Communications Workers of America is on the lookout for a new data specialist. While this position requires more technical skills than craftiness with a pen, an ability to effectively communicate is a must! Plus you will be using your talents to advance the cause of unions and workers. This job opening is for someone with an appreciation for data. Your role will be gathering and understanding this data, as well as telling others how to make the information work for them. You will provide leaders with guidance on tactics and tools to help them achieve goals. The position is located in Washington, DC and requires a BA or BS in a related field or equivalent work experience. Income ranges from $55,056 to $77,575 a year. If interested, send a resume and cover letter to CWA Human Resources at human_resources@cwa-union.org. Provide data, targeting, and technological guidance and support for organizing, issue, and/or electoral campaigns. Use tools and techniques to conduct targeting, analysis, and reporting for organizing, issue, and/or electoral campaigns. Assist staff and affiliates in developing strategies, data processes, and reporting to accurately measure progress toward organizing goals. Provide data driven strategic guidance on best tactics and tools to achieve goals to leadership. Create and/or maintain internal databases, including manipulation of voter, membership, volunteer, and other person level data. 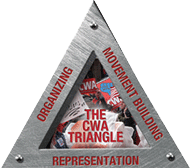 Work across departments and with vendors to integrate the flow of information across organizing tools and other systems used by CWA. Develop and administer data collection systems for integrating data from field and digital campaigns. Familiarity with online and electoral tools and datasets such as Action Network, Salsa, Catalist, VAN, and other constituent relationship management tools. Strong interpersonal and communication skills, including the ability to communicate technical subjects to non–technical individuals. Understanding of common direct voter contact programs and labor organizing practices. Experience in the use of data and analytics to drive effective decision-making in organizing, issue, and/or electoral organizing. Ability to work long and extended hours when needed.